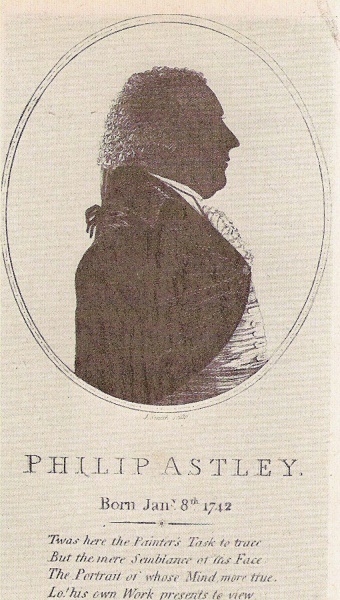 Philip Astley ( 1742 – 1814) is regarded as the father of the modern circus. At the age of 9, young Philip became apprenticed to his father, a cabinet maker. But the young boy had another, more compelling love: horses. At seventeen young Philip joined Colonel Eliott’s Fifteenth Light Dragoon Regiment, where he rose up in the ranks to become a Sergeant- Major. He served in the French and Indian War and became a brilliant rider in the process. London at this time of year [September] is as nauseous a drug as any in an apothecary’s shop. I could find nothing at all to do, and so went to Astley’s, which indeed was much beyond my expectation. I do not wonder any longer that Darius was chosen king by the instuction he gave to his horse; not that Caligula made his Consul. Astley can make his dance minuets and hornpipes. But I shall not have even Astley now; Her Majesty the Queen of France, who has as much taste as Caligula, has sent for the whole of the dramatics personae to Paris. By 1774 Philip had turned his open air riding school into a permanent structure. He was flouting the law, for he had no license. But he had taught the Lord Chancellor’s daughters to ride and was therefore allowed to continue. ** The structure burned in a fire that year and reopened in 1795 as the Royal Grove. Another fire 1803 in prompted Astley to rebuild again. Now known as the Royal Amphitheatre, the great ring inside the building featured dramatics like the Blood-Red Knight, Fatal Bridge 1810; Battle of Waterloo 1824, Buonaparte’s Invasion of Russia, and the Conflagration of Moscow 1825. Astley also took his popular circus to France. He would not open a new Amphitheatre there until after the Revolution, but when he was able to he entered into an agreement with Antonio Franconi, the “business brains” behind the team. 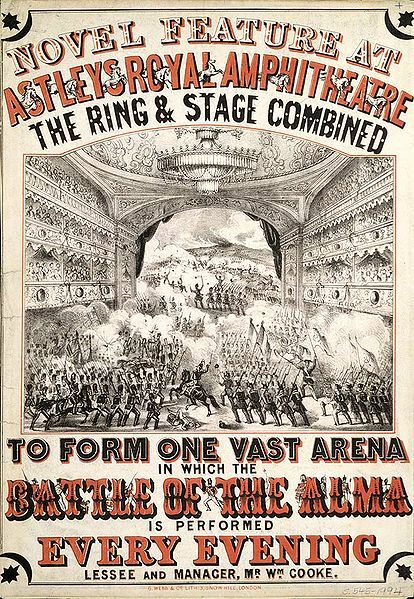 After the fire in 1803, Astley’s Royal Amphitheatre was rebuilt in the style of rival Charles Hughes’s Royal Circus. Astley’s new theatre was lavishly decorated by Scottish scene painter John Henderson Grieve and its stage was said to be the largest in London. 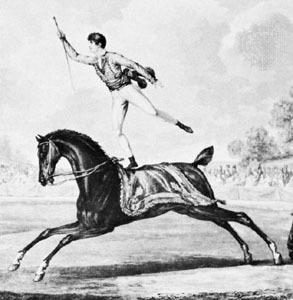 Spectacular dramas were arranged by Andrew Ducrow, the new manager and one of Astley’s former riders. When this theatre burned down in June 1841, Ducrow was said to have died mad, grieving from the losses he sustained in the fire, including his old faithful servant who lost his life in the conflagration. The interiors of Astley’s amphitheatres were designedwith a proscenium stage, a pit, and boxes and galleries for spectators. The pit was reserved for the rides, and soon became a standardized 43 feet in diameter, its circular enclosure surrounded by a painted four foot barrier. In Jane Austen’s day, the stage had become large enough to accommodate the spectacles of reenacted battles and galloping horses. These dramatics were hugely popular with the crowd, who represented all walks of life. 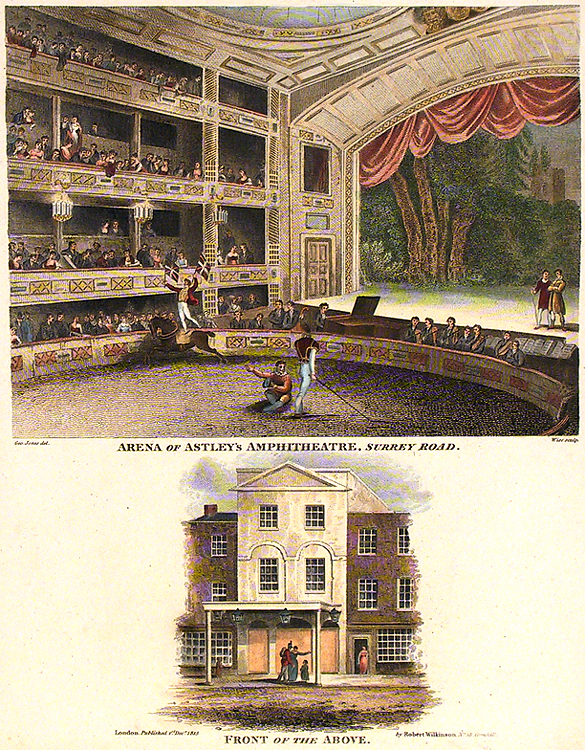 By 1818, four years after Astley’s death, the adjustable proscenium could be increased from forty to sixty feet. The enormous stage accommodated galloping horses as well as carriages, and could be raised or lowered mechanically. Such a huge stage space was able to hold military extravaganzas that featured hundreds of soldiers and horses, and cannons as well. Copper engraving of the theater with facade, published by Robert Wilkinson, London, 1815. Engraved by W. Wise after Geo. Jones. Astley lived to the ripe age of 72. He died in Paris, Oct. 20th, 1814 and was buried at the Père Lachaise cemetery. Sadly, his grave is no longer visible and neither is his famous Amphitheatre, which finally closed in 1893 under different management and was demolished in 1895. During his lifetime, Astley is said to have built nineteen different theatres. Wow Vic, this post is really interesting and fun! I lurve the pictures of course. It looks and sounds like it was quite an amazing theatre and show to watch during that era. Thanks for sharing! on January 19, 2010 at 00:52 Meredith R.
Georgette Heyer mentions Astley’s Amphitheatre in a number of her novels, so I am especially pleased to read this detailed post. What a very interesting post! I had no idea Astley’s was so large, and had never known the history of it’s founder. Thanks for a very good read. Oops. “its founder”, not “it’s founder”. Oh, I hate when I do that! I think that Dickens mentions Astley’s also. I was thinking that it is interesting that, although there is this reference to Astley’s in Emma, Jane doesn’t set any of her action or any of her real heroines in an exotic setting like this. It seems as though she is only comfortable about placing her heroines in settings that she knows very thoroughly. Thank you for such a wonderfully interesting and well-researched article. Really lovely research and photos… what a great blog! Outstanding! Amazing story about an amazing guy. Originally, I thought it was some kind of theatre or concert hall. Should have known John Knightley would not have taken Harriet and Robert somewhere so ordinary. What romantics those Knightleys turned out to be. I am almost finished writing a thriller romance and decided over the weekend to hide my murderer in plain site, working at Astley’s. Where else could a beautiful woman hide from detectives?